My mother-in-law's phone balked at backing up. But she has nearly nothing on it. The trouble? An accidental video. Mac 911 sometimes has questions that strike close to home—in this case, literally in my house when my mother-in-law was visiting recently. Her iPhone 6 Plus kept producing an error when it attempted to back up to iCloud, and was pushing her to upgrade her iCloud storage from the (absurdly low) 5GB free level to one of the paid tiers. My wife and I had tried to troubleshoot this before, because my mother-in-law uses her phone mostly for phone calls, and doesn’t use it to shoot pictures, rarely messages, and has installed only a few apps. She didn’t have iCloud Photo Library syncing enabled (in Settings > iCloud > Photos), and her iCloud storage had just a few tens of megabytes in it. Then I realized we were looking at the problem from the wrong side. We assumed she had nothing on her phone because we knew her behavior and her testimony about how she used her phone. I went to check storage (General > Storage & iCloud Usage), and when I tapped Manage Storage discovered she had a perplexing 7.5GB in Photos & Camera. A trip to the Photos app found a 5.5-hour movie of her countertop. She must have jarred it into recording just before plugging it in to recharge, and it remained recording until she next removed it from the dock. That movies was about 7GB. I deleted it, and then was able to perform an iCloud sync just fine. The warning message about iCloud storage was a red herring, because it didn’t explain how to manage storage. 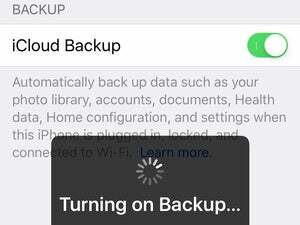 You can’t suppress media backup to an iCloud backup, unless iCloud Photo Library has been turned on, in which case it’s just shunting images and videos to a differently provisioned portion of your iCloud storage. Synced to Photos on her Mac, made sure her separate hosted backup service had made a copy of those images, and then deleted them from the iPhone. Upgraded to 50GB of iCloud storage ($1 a month) and used a regular iCloud backup. 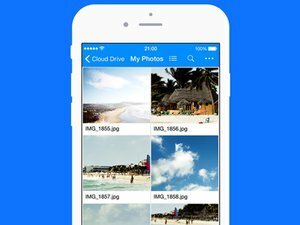 Upgraded to 50GB of iCloud storage and enabled iCloud Photo Library, which more frequently syncs images.